As the east wind whistles down the Whitechapel Rd spare a thought for the men in their kiosks, perhaps not quite as numb as the stallholders shivering out in the street but cold enough thank you very much. 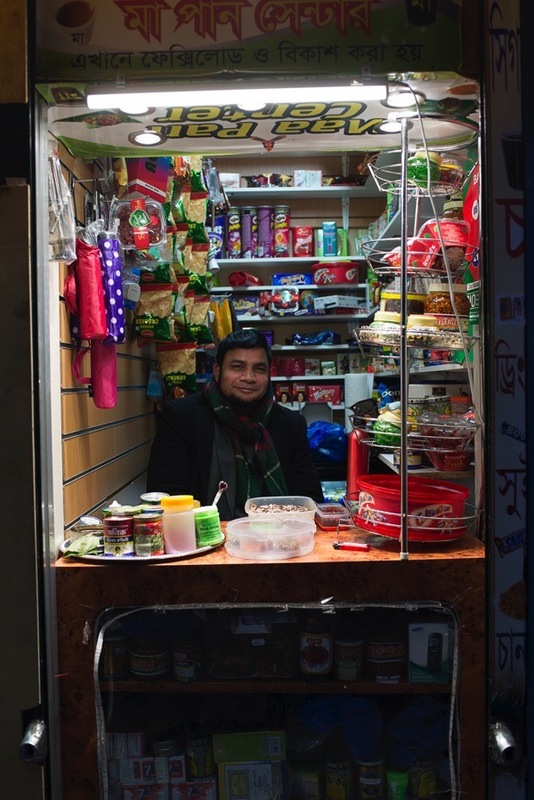 Yet in spite of the sub-zero temperatures, Contributing Photographer Sarah Ainslie & I discovered a warm welcome this week when we spent an afternoon making the acquaintance of these brave souls, open for business in all weathers. I have always marvelled at these pocket-sized emporia, intricate retail palaces in miniature which are seen to best effect at dusk, crammed with confections and novelties, all gleaming with colour and delight as the darkness enfolds them. It takes a certain strength of character as well as a hardiness in the face of the elements to present yourself in this way, your personality as your shopfront. 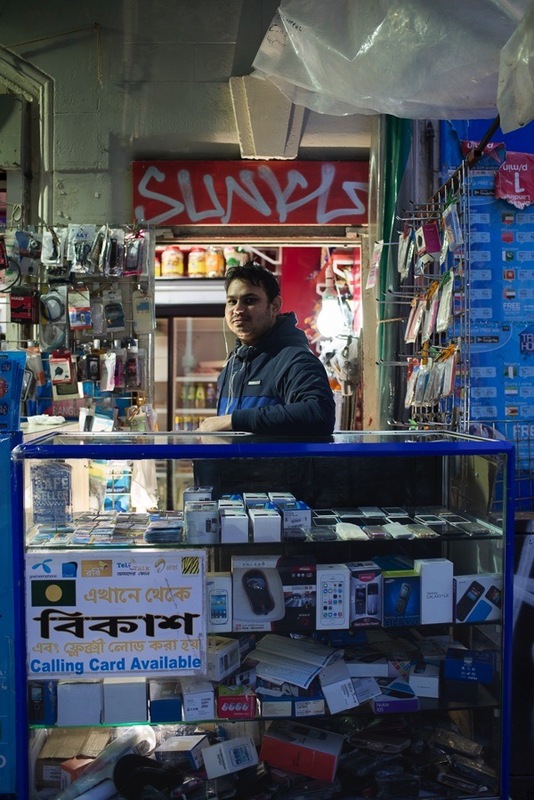 In the manner of anchorites, bricked up in the wall yet with a window on the street and also taking a cue from fairground callers, eager to catch the attention of passersby, the kiosk men embrace the restrictions of their habitation by projecting their presence as a means to draw customers like moths to the light. 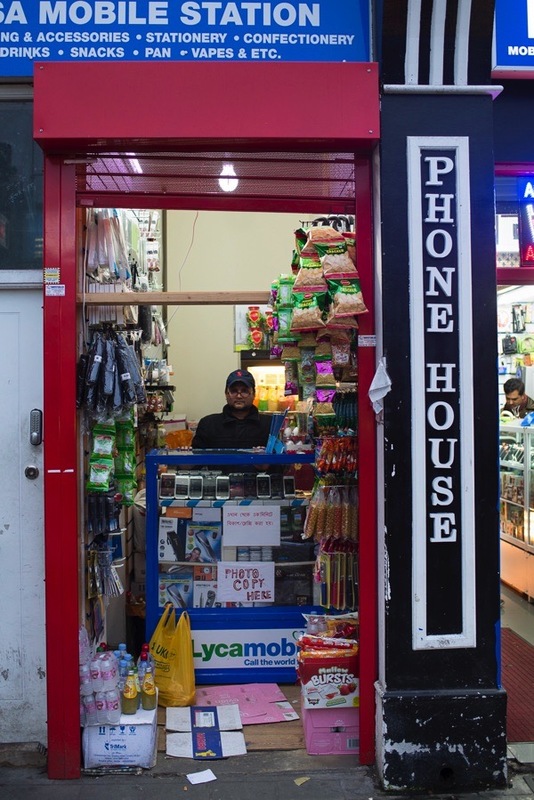 In Whitechapel, the kiosks are of two types, those offering snack food and others selling mobile phone accessories, although we did find one in Court St which sold both sweets and small electrical goods. 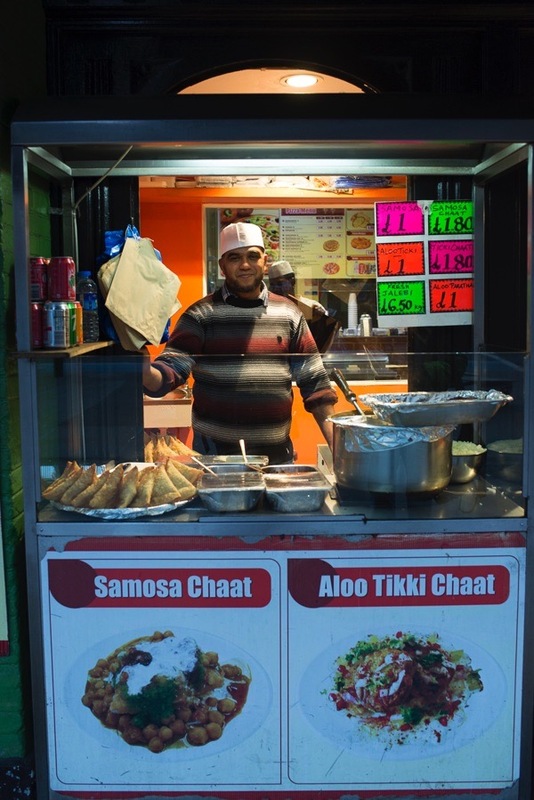 For £1.50, Jokman Hussain will sell you a delicious hot samosa chaat and for £1 you can follow this with jelabi, produced in elaborate calligraphic curls before your eyes by Jahangir Kabir at the next kiosk. 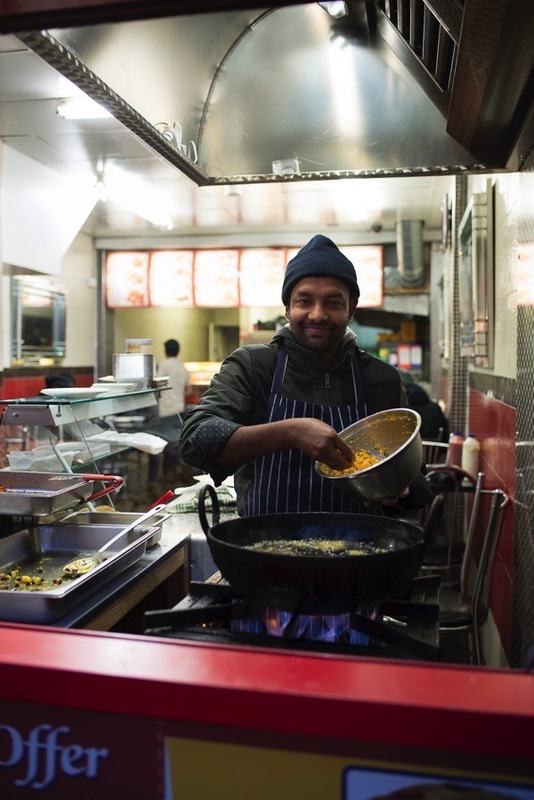 Then, if you have space left over, Mannan Molla is frying pakora in the window and selling it in paper bags through the hatch, fifty yards down the Whitechapel Rd. 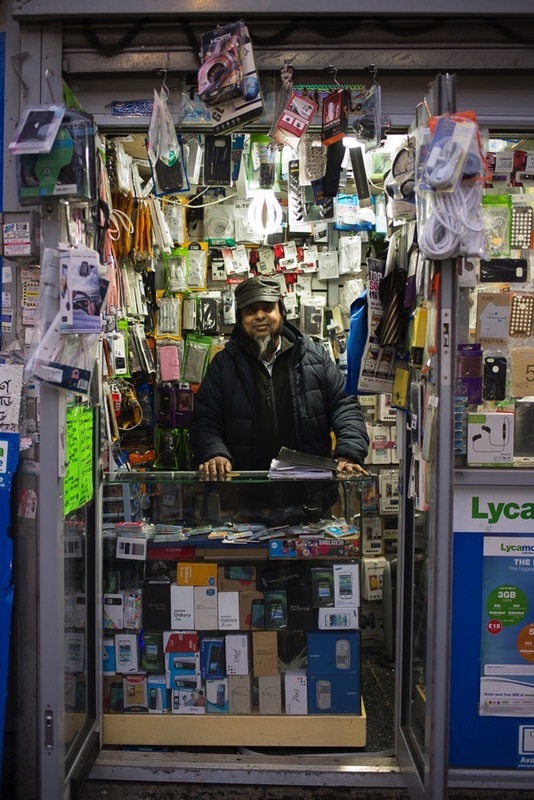 Meanwhile if you have lost your charger, need batteries or a memory stick in a hurry, Mohammed Aslem and Raj Ahmed can help you out, while Mr Huld can sell you an international calling card and a strip of sachets of chutney, both essential commodities for those on-the-go. Perhaps the most fascinating kiosks are those selling betel or paan, where customers gather in clusters enjoying the air of conspiracy and watching in fascination as the proprietor composes an elaborate mix of spices and other exotic ingredients upon a betel leaf, before folding it in precise custom and then wrapping the confection into a neat little parcel of newspaper for consumption later. 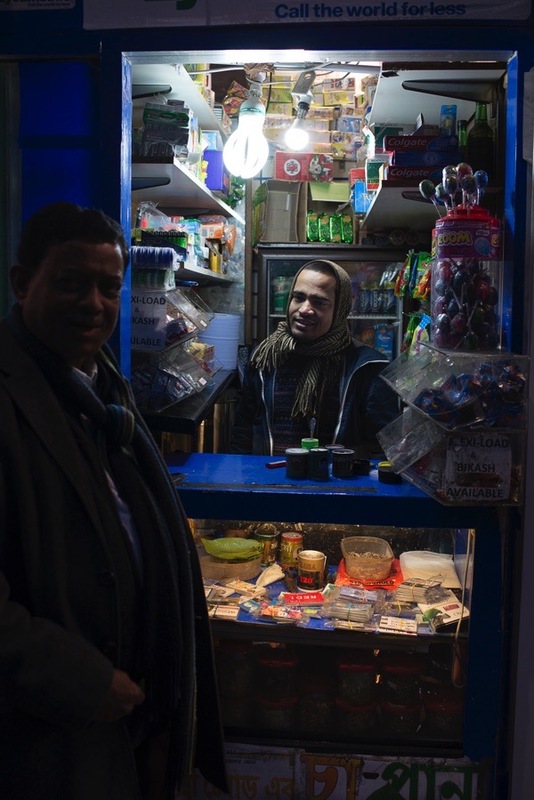 Once we had visited all the kiosks, I had consumed one samosa chaat, a jalebi, a packet of gummy worms and a bag of fresh pakora while Sarah had acquired a useful selection of batteries, a strip of chutney sachets and a new memory stick. 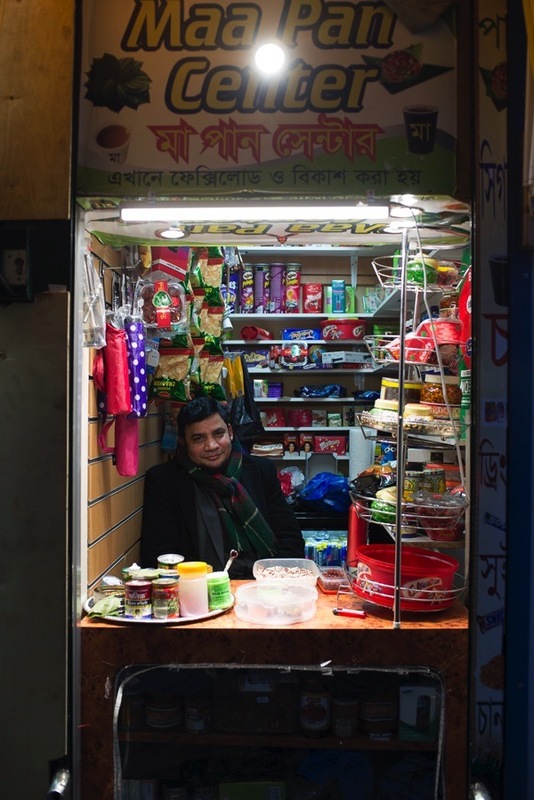 We chewed betel, our mouths turning red as we set off from Whitechapel through the gathering dusk, delighted with our thrifty purchases and the encounters of the afternoon. How about our open spaces and parks ? Great photos! 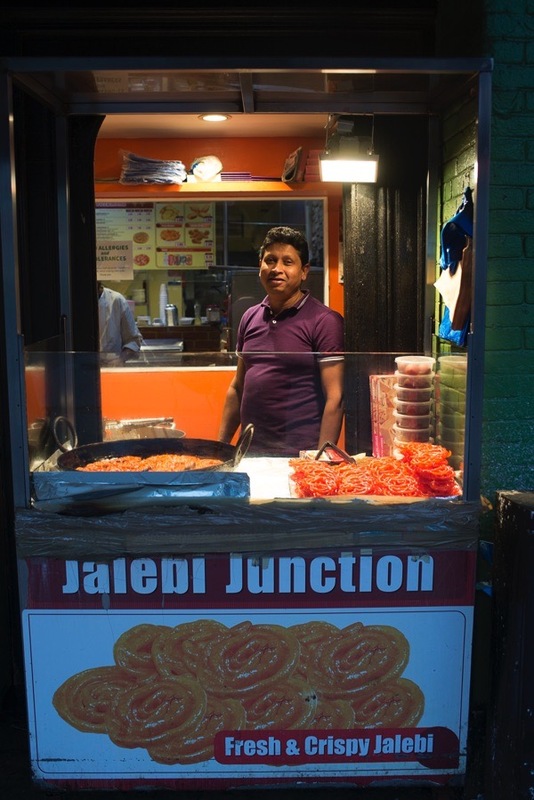 As a Londoner who’s lived abroad for nearly 20 years, to be able to just buy quality chaat or pakoras on the way home is a far off dream! Lovely piece and photos, and just look at those smiles! oh! that samosa man! i think my hubby dragged me away from one of these to my eternal regret. we need these in l.a.